The beauty of the compact. 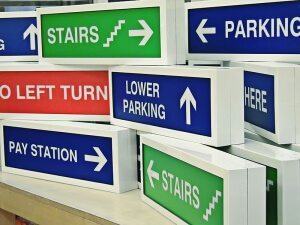 Because it’s practical; most businesses need small items of signage within their premises for directional or labelling purposes. Not limited to but including marking toilets, room names, conferencing and exits. Just because they need to be there, however, does not lower their value as part of your branding. Small signage is noticed just as much as the large shopfront name and display. Customers just may not realise it. Because it’s pretty; the opportunities presented by using a small canvas are greater than you may expect. Craft and art are evident in the intricacies of miniature items and signs are no different. Once customers and clients are within your premises or business environment, their interest can be maintained and stimulated by attractive and creative internal signage. Symbols – The classic example and first to come to mind is the universal symbol for toilets. Why stop here though? Whether you represent zones, areas or directions by creatively visualised symbols, or illustrate your text with logos, a visual element can encourage engagement from customers and partners alike. Screen – Digital displays have been undergoing a quiet revolution over the last couple of years. The industry has been shunning the mammoth and, conversely to the increasing size of personal display screens of smart phones, have been shrinking. It’s all about interactivity. Smaller displays are not designed to draw attention with a ‘wow’ factor, but to appeal to the individual. They are designed to work with shorter distances and so the interaction between consumer and display becomes more personal, influencing the customer to become more inclined to take note of the information on offer. A lot depends on materials, which in turn will be dictated by a brand message and the function or durability of the sign. When managing your budget, mixing the materials that you use can make your pounds go further. Vinyl Graphics – For temporary additions, special offers and highlighting, stickers or posters are an excellent solution. Small stickers are an ideal corporate novelty, whether for a vehicle or window. Adding your logo onto property and vehicles is an inexpensive way of pushing your brand awareness out there. If you’re not looking at promotion, the practical uses of small adhesive graphics or vinyl text are considerable; think labeling, directions, information, identification. Acrylic – The tactile high gloss finish is ideal for a small piece of signage. It brings with it a professional feel which is appealing for customers within a hospitality, leisure or retail environment. Metallic – If your business mantra is more contemporary, professional or clinical then metallic materials may appeal for your diminutive signage. Far too often the smaller sized items in a signage scheme become an afterthought. Used correctly however, the small, the functional, and the undervalued are actually key to completing the corporate identity for your business premises. 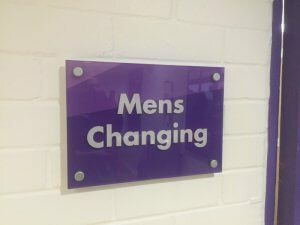 Not only that, but when used cleverly and in conjunction with alternative materials, high spec small signage can boost the image of your entire working environment.